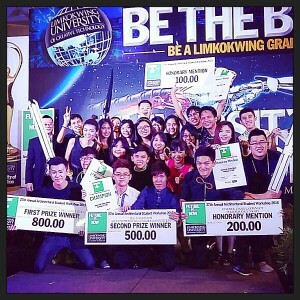 Twenty-seven students from the Department of Architecture & Sustainable Design (DASD) and Lee Kong Chian Faculty of Engineering & Science (LKC FES) won four out of the six categories they competed in at the 27th Architectural Student Workshop held at Limkokwing University from 20 to 24 October 2015. Organised by the Malaysian Institute of Architects (PAM) and themed 'Future Is Now', the workshop allowed the students to prove themselves by winning first place for Portal 3D Model Expression, first runner-up for their video production “Aftermath”, as well as two honorary mentions for stage performance and photography. The students invested two weeks of their semester break in intensive preparations. They were guided by DASD staff, acclaimed stage actress, Ms Pearly Chua (Emily of Emerald Hills), and dancer, Ms Tan Bee Hung. They demonstrated great enthusiasm and admirable team work. Throughout the process, they also enjoyed the spirit of camaraderie and interactions with participants from other universities. This being UTAR’s third year participating, the participants faced off against other institutions including Taylor’s University, Universiti Sains Malaysia (USM), International Islamic University Malaysia, University Putra Malaysia (UPM), Universiti Kebangsaan Malaysia (UKM), and more. The workshop was initiated by Limkokwing University Vice President Emeritus Professor Datuk Parid Wardi Sudin in 1987, serving to gather and share knowledge between public and private institutions for more sustainable and efficient architectural designs.